To someone driving through Butte, Montana for the first time, one image dominates the landscape: the expanse of the Berkeley Pit to the north. 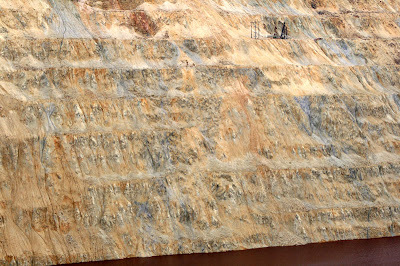 The Pit extends 1700 feet from the top of the rim near the old Bell-Diamond Mine to the bottom of the over 40 billion gallons of acidic water that make up the slowly rising Pit Lake. The sheer magnitude of the site, a functioning mine from 1955 until 1982, is enough to draw attention. But the environmental science underlying the Berkeley is the real cause for interest. From the early days of underground mining in Butte, the hill has been dewatered by underground pumps. Those pumps ran continuously from the late 1800s until 1982. When economic conditions forced the Berkeley Pit to close, ARCO, the parent company of the Berkeley, decided to shut off those underground pumps. The result is the Berkeley Pit Lake we see today. Without the pumps to keep the thousands of miles of tunnels beneath the Butte Hill dry, surface runoff and seeping groundwater began to accumulate, eventually reaching the bottom of the Pit. Throughout the 80s and 90s, the water level in the Pit continued to rise, and today the Pit Lake is over 1000 feet deep. The water in the Pit is highly acidic, with a pH of about 2.5. A process called Acid Rock or Acid Mine Drainage is the culprit. Not all of the rock extracted from the Butte Hill and the Berkeley is valuable. A high percentage is waste rock, and a considerable amount of waste rock still sits behind the Berkeley to the north and east. Rock from the Butte ore body is high in sulfur, mainly in the form of iron pyrite or fool’s gold. When exposed to air and water, the iron pyrite is oxidized. Mixed with surface and ground water, the sulfur increases the acidity of the water. This increased acidity, in turn, causes the other metals present in the rock, such as copper, lead, cadmium, and zinc, to dissolve into the water. In the case of the eastern slope of the Butte Hill, all of this Acid Rock Drainage water flows, either over the surface or through a natural cone of depression in the ground water table, into the Berkeley Pit Lake. 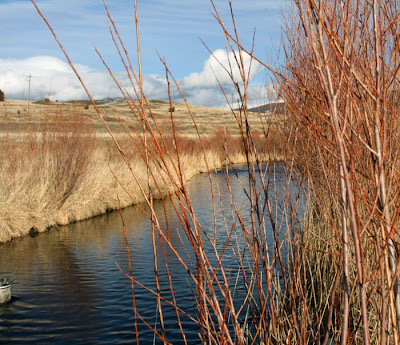 In this way, the Berkeley is not all bad: the collection of acid water there prevents it from spreading elsewhere where it could potentially impact the Butte valley or, just downstream, the Clark Fork River. While the Berkeley water is certainly toxic, it is not as deadly as some suppose. The acidity of the Pit, with a pH of 2.5, is about the same as the acidity of your favorite soft drink. In other words, the Pit water is not going to instantly dissolve anything that touches it. There have been incidents of bird deaths in the Pit resulting from birds drinking and swimming in the Pit water continuously for more than a day. Today, hazing activities prevent birds from spending too much time in the Berkeley. The main human health risk from the Berkeley involves the possibility that the water level may some day rise high enough to infiltrate into surrounding ground water aquifers. Such an occurrence could potentially contaminate drinking water wells, or contaminate ground and surface water downstream. The critical water level at which Berkeley water could spread out from the Pit is 5410 feet above sea level. The surface of the Pit Lake currently sits at 5282 feet above sea level. As the water level rises only a few feet each year, that leaves a lot of time before the critical level is approached. Current projections estimate that the Pit Lake will near the critical level some time after 2023. A strategy is already in place to manage the Pit water when that time comes. In 2003, construction was completed on the Horseshoe Bend Water Treatment Plant on the northeast rim of the Pit (as pictured below). 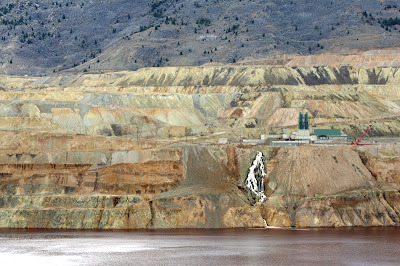 Already tested and used in Montana Resources nearby mining operations, the Treatment Plant will pump and treat the Berkeley Pit water before it reaches the critical level. The water is treated by adding materials, primarily lime rock, that reduce the acidity. As the acidity decreases, the metals and other toxins dissolved in the water settle out in a solid “sludge.” This leftover sludge will be dumped into the Pit, in effect, backfilling it very slowly. Treated, clean Pit water will be used in Montana Resources mining operations or discharged into nearby Silver Bow Creek (pictured below just downstream and to the west of Butte and the Berkeley). While the visual and scientific spectacle of the Pit is essential to our current understanding of it, the most important legacy of the Berkeley cannot be seen at the Pit itself. Over 300 million tons of ore came out of the Berkeley, and the copper from that ore gave electricity and light and development to the U.S. and beyond. The next time you flip on an electric light in the middle of the night, take a second to remember the Berkeley Pit, and the true cost of the development we enjoy and often take for granted today. 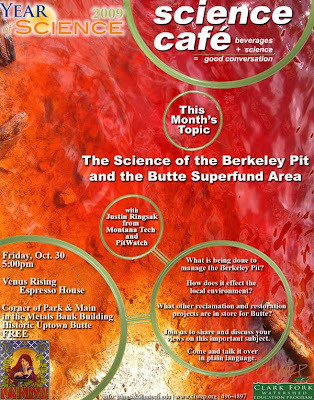 Want to learn more about the Berkeley Pit, past, present, and future, as well as other environmental reclamation projects around the Butte area? Join Justin Ringsak for a Clark Fork Watershed Education Program Science Café discussion on the Berkeley Pit on Friday, Oct. 30 from 5:00 to 6:00 P.M. at the Venus Rising Espresso House, corner of Park and Main in uptown Butte. I was looking through a few Berkeley Pit articles and yours is by far the most valuable. Thanks.